A white dial with black numbers and hands make this easy to read - even though the roman numerals are written in an elegant font. 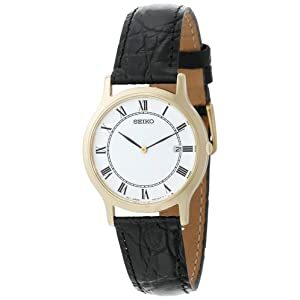 The brass case and bezel are very classy, and the black leather strap looks perfect with this watch. Accurate time is ensured by the Japanese quartz movement. The date is easy to overlook at first, but it's there in the 3 position. This watch does not have luminous hands or hour markers, so you'll need light to tell what time it is. It's a cool dress watch that looks great and is very affordable.